Join us at our warehouse studio and learn how lovely it is to work with Chalk Paint™ by Annie Sloan. See how versatile it is! We will show you how it can be used in a number of different ways to transform tired or dated furniture into fresh, beautiful pieces. 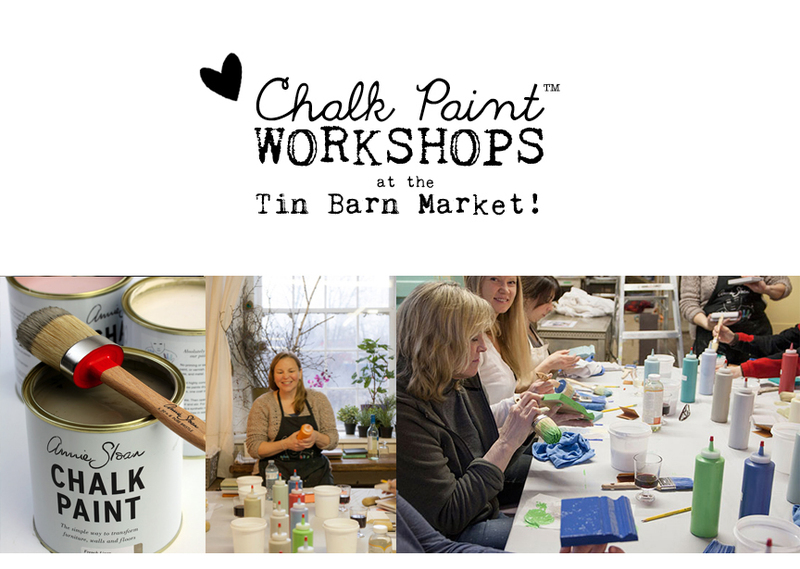 This workshop will give you the experience and confidence to complete your own Chalk Paint™ projects. We cover several application techniques and you will create sample boards of each one to take home, along with an Annie Sloan paint colour chart, to help plan your future projects. You will also learn the proper technique of applying clear, dark, black & white Soft Wax to create a beautiful old world, protective finish. All supplies are included. Just show up in your painting clothes! Skill Level: All students - No prerequisite required. Cost: $85+hst. You can reserve your space by paying in-store or over the phone with a valid credit card. A non-refundable deposit of $40 will be retained for all cancellations with less than 7 days notice. Special Offer: 15% OFF on (up to 4 cans of) any paint purchase on that date. Do you have a tired looking piece of furniture moping around the house? Join us at our warehouse studio and let us help you transform it into something fresh that works with your current decor. This session is for anyone who wants to learn about Chalk Paint™ while jumping right into refinishing a small furniture piece. You will have the benefit of a trained Chalk Paint™ instructor guiding you through the process of achieving a finish of your choice. You will have access to all the beautiful Annie Sloan colours, an opportunity to try the selection Annie Sloan brushes, and instruction on the proper techniques for waxing with clear, dark, black and/or white wax for the perfect finishing touches. We recommend this class for beginners, or for those who have already taken Chalk Paint 101 and learned the basics. While you paint, we will be there to offer tips & advice to help you get beautiful results. Classes are limited to 8 people so that we can offer as much one on one instruction as possible. Skill Level: All students - ChalkPaint™ 101 can be a helpful class to take beforehand if you would like to experiment with a variety of colours and techniques before deciding on the finish for your piece. Cost: $165+hst. You can reserve your space by paying in-store or over the phone with a valid credit card. A non-refundable deposit of $80 will be retained for all cancellations with less than 7 days advance notice. Includes: all tools and supplies and 4 hours of instruction time.